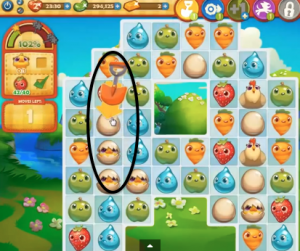 These Farm Heroes level 194 cheats and tips will help you beat level 194 of Farm Heroes. 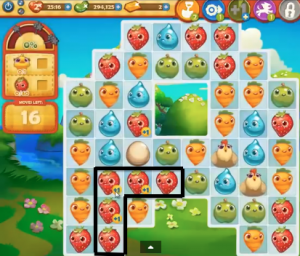 The objective of Farm Heroes level 194 is to achieve 100% growth, and collect 1 chick and 40 strawberries in 18 moves. 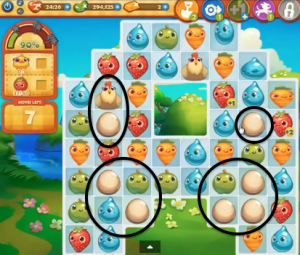 Though hatching the chick on Farm Heroes Saga Level 194takes more time, there isn’t much you can do in the way of hatching chicks when the level begins because the hens haven’t laid any eggs. Spend this time collecting as many strawberries as you can. Don’t bother collecting other cropsies, it is just a waste of your extremely limited moves. Once the hens have jumped around the board a bit and have laid a sufficient amount of eggs (this will be at around the 10 move mark or later) begin to make matches to hatch a chick. At this point you should have collected at least 30 strawberries, and continue to keep an eye out for them while you match eggs. If you find yourself running low on moves, using the shovel on eggs will cause them to advance one stage. This is a helpful shortcut that can save you two or three moves when hatching eggs.